Today, Chinese mobile phone maker Huawei officially announced the availability of a new, exclusive flavor of its Ascend P7 smartphone, in the form of Huawei Ascend P7 Arsenal Edition. The new device lands on shelves with support for 4G LTE networks and also promises a series of features aimed specifically at North London club’s most loyal fans. The mobile phone has been announced with a sleek, black metallic finish, as well as with a 5-inch full HD touchscreen display protected by Corning Gorilla Glass 3. The new limited edition device features Arsenal’s iconic club crest, which has been mounted on the rear cover, right under the tough Gorilla Glass 3. Moreover, the mobile phone maker reveals that the smartphone will provide an enhanced Arsenal experience courtesy of a variety of themes meant to fit any mood, including bespoke Arsenal menus. The Arsenal Edition device also features dozens of iconic Arsenal wallpapers, such as images from iconic Highbury buildings, as well as scenes of the Emirates by day and night, and more. 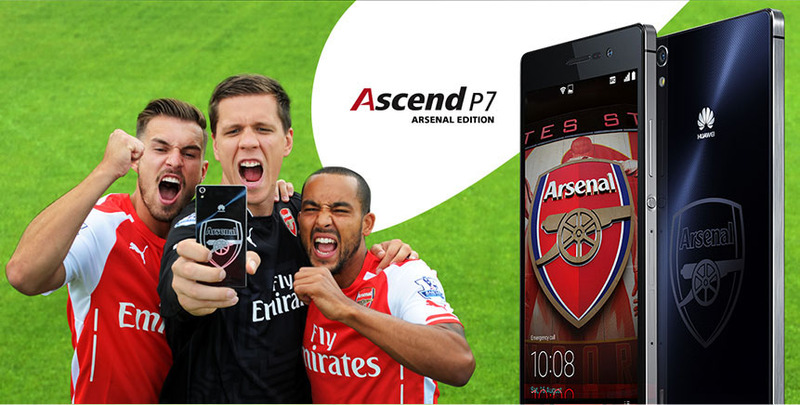 On top of all that, the Huawei Ascend P7 Arsenal Edition comes with a working clock that is based on the famous Arsenal Clock End. You can learn more on the smartphone on its official website. The handset also features a 13-megapixel rear camera, along with an 8MP front camera, allowing users to capture great videos and photos while on the go. It supports up to 64GB of additional storage, offering enough space for selfies and other content. “Huawei Ascend P7 is a powerful multimedia smartphone and the Arsenal edition uses this to give a great experience to Arsenal fans with some of the world’s best football games preloaded such as FIFA 14,” the handset vendor notes. Moreover, the smartphone features the Yakatak app, which should prove great when it comes to receiving updates on games as they happen. It also offers a unique direct link to social networking friends, so that users can easily chat about Arsenal and clubs from 400 leagues. All of the other features and capabilities that Huawei Ascend P7 has been revealed with are also included in this limited edition device, like a 1.8GHz quad-core HiSilicon Kirin 910T processor, 2GB of RAM, and Google’s Android 4.4.2 KitKat operating system. “We are two powerful brands and this makes Huawei a great match for a club with the global stature of Arsenal,” Richard Ren, president, Huawei Consumer Business Group, Western European Region, says.